Today i need something silly to cheer me up: i’m in Turin, it’s August and the whole place is inert. All the art galleries are closed. Half of the cinema are ‘on holiday pause’ and even the postman hasn’t brought any bill nor urgent (sigh!) parcel for two weeks at least. I’m in need of a distraction so let me tell you about the Poo Printer…. 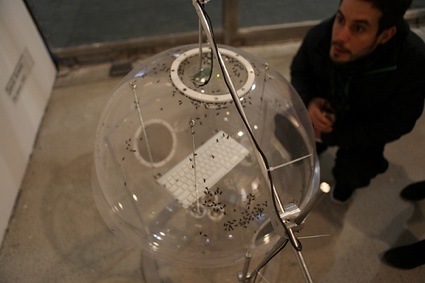 Fabrizio Lamoncha entrusted a group of male zebra finches to be the main makers and actors of the Poo Printer, an analog generative typography printer using bird-poo to slowly trace the Latin alphabet characters, poo pixel by poo pixel, over a large paper roll placed under the cage. The Poo Printer consists of a wooden cage sized 170x120cm and 100cm high with a removable tray in the center. This tray has interchangeable parts looking like tree branches with integrated food dispensers. According to the order of placement of these pieces it creates the shape of each of the characters of the Latin alphabet. The birds will hang out there most of the day, eating, pooing and even eating and pooing simultaneously. Hi Fabrizio! What made you develop the work in the first place? A desire to bring humour to generative typography? A passion for male zebra finches? What were you researching exactly? The first idea was to make this project outdoors with wild birds, but I had to find out if the project would work or not, so I simulated this process with captive birds. 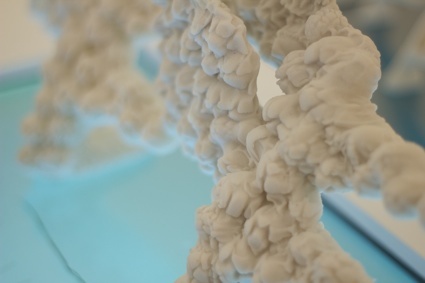 The conceptual idea was questioning technological development in relation to the current definitions of nature, inquiring the response of the audience to this topic. 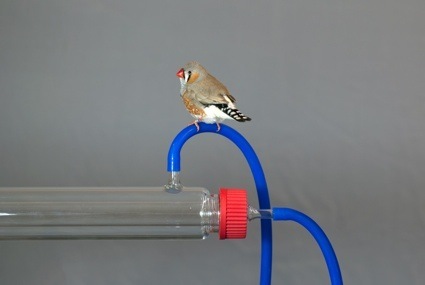 I decided to document the research very rigorously to be able to give detailed information about my work with the finches, just as rigorously as any experimentation with animals should be. Why did you chose to work with male zebra finches specifically? Zebra finches are one of the most common and known captivity birds worldwide. They are small birds and that allowed me to reduce the size of the prototype. Something that also made me decide for the finches and no other species of birds is that although the finches have adapted very well to the captivity conditions, they are still afraid of humans. On the other hand we still consider them as pets, and when they are exhibited, the visitors, whatever their opinion on the project is, still inevitably empathize a lot with the birds. This natural engagement of the audience was very positive for my research. 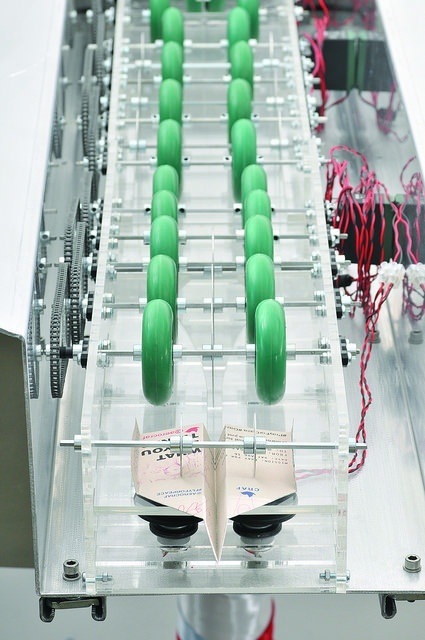 How many birds are participating in this experiment of ‘simulated factory-chain’? During the research period, I worked with four of them. Currently, I am exhibiting the final version of that first prototype. This one is sent empty, together with instructions and tips for the correct care and adequate environment for the birds, such as the light conditions, ventilation, etc. In this case, the contractor is the one in charge of finding the birds and taking responsibility for their welfare. Last time, for example, the curator borrowed the finches from a nearby animal shelter and at the end of the exhibition, they brought them back. The description of the project says that “The observation of this group of non-breeding birds in captivity and the experimentation with induced behaviors has been rigorously documented for this task.” Could you explain and maybe give examples of the observation and research you’re referring to? This project simulates a product performing generative typography with bird droppings. My goal as the producer was achieving maximal efficiency, which means finding the ways to make the birds focus on the feeding – the more they eat, the more they poop. This variety of birds have different daily routines, such as times for feeding, sleeping, pecking, grooming, etc. But these routines can be modified according to their needs. For example, finches are hierarchical animals. It´s part of their nature, and as I said before, part of their daily routine is to peck at each other to move up the hierarchy. This is not an act of violence, but just a role game. My work was to transform this power structure into a peaceful flat hierarchy. Since I was documenting their routine 24/7, I found out that their perception of human presence stimulated their social bonds. Human presence represented a threat for them, and their reaction to that was to come together. On the other hand, as soon as they were alone again, the pecking would continue. Since I was not able to stay around them all of the time, I researched the ways I could simulate human presence. I researched on their abilities to form concepts, and recalling 1984, I tried placing severe human portraits, and playing recordings of political speeches. The funny thing is that everything worked -but only for a while. How long does it take for the birds to print a letter? It depends on the amount of birds and surface area of the letter. I just can tell you that with four finches you can make an I in one day, or an A in a bit more than two days, it all depends on the shape of the symbol. Did everything go according to your plan? Or did the birds manage to surprise you? From the perspective of the development of the project itself, I have to say that everything went surprisingly well from the beginning. I documented myself a lot before, but I still think that I am very lucky. From the personal experience, I guess whoever has shared a part of his life with animals could tell you the same. Taking responsibility for the welfare of a living being is a transforming experience. Are you going to keep the birds as pets? To be honest, I was never a big fan of keeping animals in captivity. When I decided to start this project, I weighed the pros and the cons of developing an artistic research under these conditions and I finally decided to put my moral issues aside and go for it. It has been an invaluable experience from all perspectives and I am very happy with the result. Of course, after sharing all that time, I became very attached to them. I wish I could have kept them all, but this was not an option. Is this good for them to be kept in strictly male company? Actually, I read that if you are not interested in breeding them it´s better to keep males and females apart, because during the breeding, the male can be very aggressive to the female. Finches are social animals, but as long as they are more than one per cage everything is fine. When they are just males, they still gather together in couples for grooming, and they are happy and peaceful with each other. It´s worth seeing! The work has received an incentive for production from the VIDA competition. So how are you planning to go further with the project? Try all the letters of the alphabet? Do other type of research in how to use birds in typography? VIDA14.0 was a great surprise and it meant a lot to me that they considered my work. In the last months, I finished the letters and the documentation and as far as I am concerned, the research is finished. Now I am focusing on the exhibition, but I wouldn´t turn down working with living animals again, it´s a very interesting topic. Any upcoming project, exhibition, areas of investigation you’d like to share with us? I keep working on the pooprinter and at the moment I am developing the instructions for an outdoor version, so people interested in the project can CNC the parts, build their own and install a pooprinter outside in their garden or wherever they want. No more bird cages. Wim Delvoye´s talk at Ars Electronica. Posted in art with animals, bio, VIDA. Bookmark the permalink.